Scoring, algorithms, stack ranking, scatterplots, migration analysis, trending. Sometimes the language of employee engagement surveys can be confusing. That’s why we are here to guide you through the analysis and reporting phase of your project. Your dedicated team of experienced Industrial Organizational (I/O) Psychologists will work closely with you to explain and understand your data. We train your leaders on how to interpret their results and take action. And we provide you a post-survey communication template to ensure employees hear about the results of the survey and how the organization will take action. TalentWatch® is a structured employee engagement system that includes a best-in-class engagement survey, detailed individual and aggregate reports down to the front-line leader level, a dynamic dashboard for senior leaders, a team meeting guide, and online action planning for all leadership levels. Learn more about the TalentWatch solution here. TalentWatch reports, both individual and aggregate, are available within 30 days of the survey administration close date. Easy-to-read formats provide each leader and stakeholder with relevant, timely and specific results that facilitate prioritizing and taking action. Click on the report image to view. Click on the image to view excerpts from a sample report. Learn more about our Co-Worker Connection solution here. 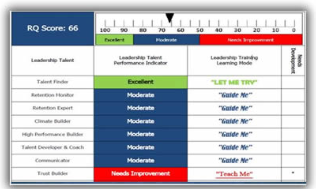 Retention Quotient is a 50-minute situational judgement assessment designed to measure a person’s understanding, of and ability to apply,10 key leadership competencies that have been proven to increase employee engagement, retention and team performance. RQ can also be used as a leadership readiness assessment for employees who are interested in a leadership role and to help prioritize the participant’s leadership development plan. RQ is often used as a source of data for succession planning. 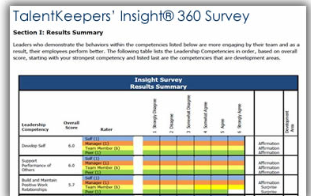 Insight is a 360º survey that solicits input from individual leaders, their team members, peers, and their manager. Insight’s objective is to enhance a leader’s awareness of their strengths and weaknesses so appropriate developmental activities can be determined and prioritized. Additionally, Insight can be used as a pre-training and post-training diagnostic tool and as part of a leadership assessment program for development and promotion. Content of the survey focuses on 10 key leadership competencies related to effective employee engagement and retention behavior. 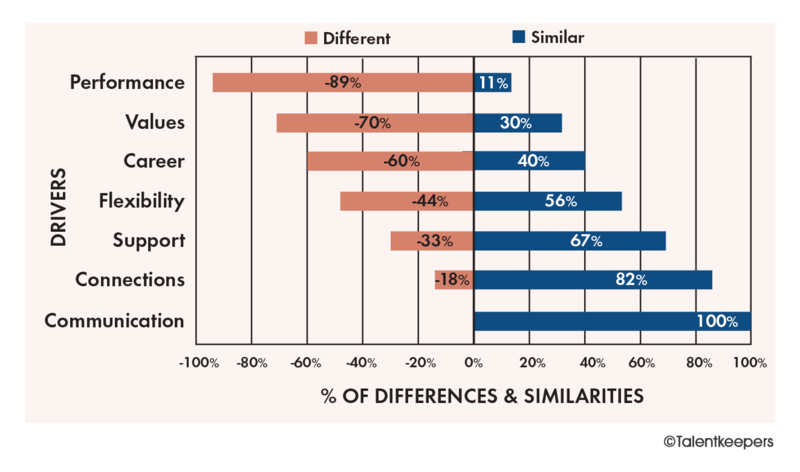 Valuable comparisons are drawn in those areas where the leader and the other respondents differed in their perceptions. Respondents, other than the focal leader and their manager, will be anonymous and identified only by their relationship to the leader (e.g., team members and peers). Reports available at individual and aggregate levels. Results of the survey illustrate how a leader perceives himself/herself, relative to the perceptions of employees, peers and manager(s). Our expert consulting team comprised of Industrial/Organizational Psychologists will review and analyze your results from all of these processes. Your results will be compiled into a comprehensive Engagement and Retention Culture Report which will summarize our findings and present clear recommendations for creating a culture of engagement within your organization. Your dedicated consultant team will present our findings to you, and other key stakeholders, to ensure you fully understand your strengths, opportunities and our recommendations. 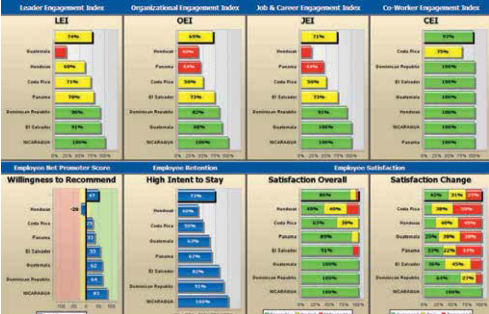 Participation results help your organization achieve a high survey participation rate. It is important to monitor participation at least weekly and follow-up with departing employees prior to leaving the organization. Individual team member results are available down to a front-line leader level. This allows the leader to receive feedback about team member trends and/or creates an opportunity for development. Aggregate results. Your organization will also be able to review group data by hierarchy through our online system. Separately, other aggregate results will also be available by request. Some examples would be to analyze results by generational differences, performance levels, and tenure. Any attributes that your Human Resources Information System (HRIS) or operational performance system captures, can be used to analyze survey results.